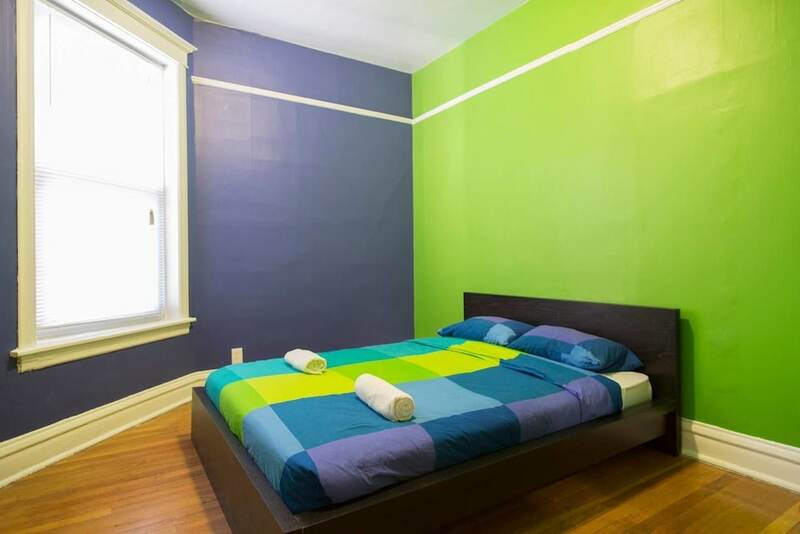 Wrigley Hostel is a well-run hostel on the city's north side. The staff is exceptional, combining gracious hospitality with warmth and charm helping you to feel comfortable and at home. The breakfast served every morning makes this a terrific place to stay when you are in Chicago.One of the top places to stay over night or for a week. The stay my friends and I had was wonderful. The hostel is in a great location, near transportation to the city center. The rooms are comfortable and we'll kept. Kitchens and the back porch are perfect for sitting with friends and meeting fellow travelers. I highly recommend staying at this hostel. A simple side chair inside of both the room and bathroom might have elevated my opinion of this hostel environment. Getting dressed after showering was made more complex by the absence of a chair. Removing my clothes before bedtime was made more difficult because of the lack of headroom between the lower and upper bunk. A chair inside the room would have been a nice enhancement. The staff was at-all-times friendly and disposed to be helpful in locating venues to visit, such as the Field Museum and Adler Planetarium. I am a senior (age 73) and never felt myself discomfited! Available personal computers functioned 100% without a hitch. Recommend the Thai Noodle Shop located just south of the hostel on Sheffield. Stayed in the Wrigley Hostal for one night when in town for a concert. I stayed in an 8-10 bed-room and was not disturbed even though the room was full. No complaints - friendly staff, clean accommodations. Really enjoyed my week at Wrigley hostel - staff were all really friendly, rooms and all the common spaces were clean and a free breakfast every morning! Located really close (2 minute walk) to Addison red line station which is a 15 minute L ride to the loop, so ideal base for sight seeing. Will definitely return if I visit Chicago again! We loved Cliff as the night worker. He was very understanding and accommodating. He rocks! I recommend staying here for a night on the town. Great location and great places nearby to eat and look around. I had never stayed in a hostel previously, but now I don't want to stay in a hotel anymore! Staff was extremely polite, helpful and accommodating. Everything was exceptionally clean and comfortable! There is rec area with cable TV, movies, games, darts, pool table and Foosball table. Kitchen areas that have everything you need! There is no parking at the hostel. The receptionist told me about an app called "Spot Hero" and I had a parking place about 400 feet away from the hostel. Only cost $20 to park from Saturday afternoon to Monday evening. I am a single female and I felt completely safe walking around the area. Day and night. The other guests were all really easy going and respectful of the other guests as well! I will absolutely be making a trip back to Chicago, specifically to stay here! Great place while traveling on a budget. Very clean, comfortable beds. Free WiFi and free breakfast every morning. I'd stay here again! Staff was very friendly and knowledgeable about the area, space was quiet. Also, they've got movie and game nights so you can meet other people! Went to hostel to get a bed for the night. Brendan at the desk told me a credit card was required for same day booking. I said I would put money on my debit card and come back. Brendan said it had to be a credit card not a debit card. Then he advised me to go to another hostel. When I went outside two guys that were staying there said they paid online with debit cards. I asked Brendan at the desk if I could just book online with my debit card. He said they required a credit card to check in even if I booked online. I asked why the other gentleman were able to book beds with just a debit card and Brendan said he didnt know and didnt have time to look it up. I think that type of unfriendly attitude that discriminates randomly is offensive and insulting. You could be next so go to another hostel. Located in Wrigleyville, Wrigley Hostel is within a 10-minute walk of popular sights such as Wrigley Field and Vic Theatre. This 8-room hostel welcomes guests with conveniences like free breakfast, a bar/lounge, and free in-room WiFi. Free hot/cold buffet breakfast is served each morning from 7:00 AM to 10:30 AM. Entertain your taste buds with a drink at the bar/lounge, or chat with other guests at the free daily manager's reception. 42-inch a flat-screen TV are available for entertainment, and guests can stay connected with free WiFi. Other standard amenities include a living room, a dining area, and a microwave. Bathrooms are shared. Wrigley Hostel features free WiFi in public areas, a business center, and coffee in a common area. If you decide to drive, there's free offsite parking. Multilingual staff at the front desk are standing by 24/7 to help with tours or tickets, dry cleaning/laundry, and luggage storage. Additional amenities include a microwave in a common area, a refrigerator in a common area, and a computer station. Free hot/cold buffet breakfast is served daily from 7:00 AM to 10:30 AM. Guests can enjoy a free manager's reception daily. The front desk is open 24 hours a day. Driving? This property offers free nearby parking, along with offsite parking (reservations required). The following credit cards are accepted: American Express, Discover, Mastercard, and Visa. Only bookings from non-local guests are accepted. Guests whose residence is within the same state as the property will not be allowed to check in. No alcohol is served at Wrigley Hostel. Only bookings from non-local guests are accepted. Guests whose residence is within the same state as the property will not be allowed to check in.